I know the season has almost passed, but this picture was so sweet I couldn't help myself. We spent Christmas Eve with our cousins Adam and Julie and their children. We had a wonderful evening; it made Christmas Eve feel like Christmas Eve. Ella was the perfect baby Jesus. Bridget was both an angel and Mary (notice the star headband).Will was a shepherd and Joseph. We even had carolers. Thanks Johnstons! We love you! (From Dave and Bev) We love checking out your blog now and then! We see all kinds of faces that we love! Ella is beautiful! Adorable! Glad you got to have such a nice Christmas, even though some of it was spent healing the sick this year. What a sweet little picture!! I might frame it and pull it out every Christmas! Bridget, Will, and Ella are all so BEAUTIFUL! Wow, your nativity looks way more put together than ours. We just used towels for their heads. Maybe I'll sew something for the kids next year. Where did you get the costumes? What a great picture! I must say that your "baby Jesus" played the part much better than ours! 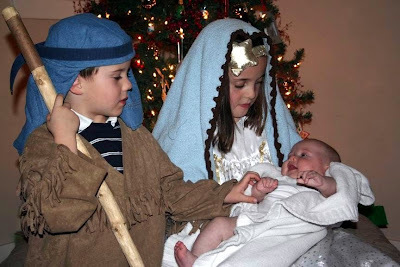 Bridget and Will were thrilled to have a real baby Jesus! She is so sweet looking up at Mary! !